Months after they pre-emptively sued to block anticipated efforts by the Environmental Protection Agency to roll back mileage regulations, Democratic attorneys general vowed to continue their fight in the courts. 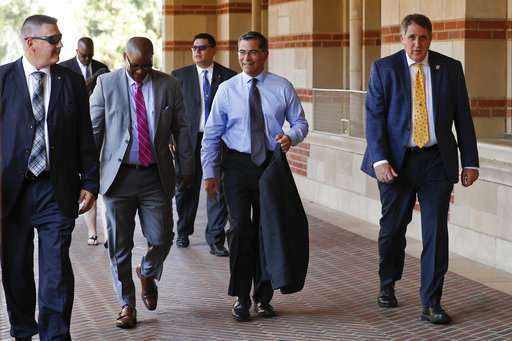 "The earth is not flat, and climate change is real," California Attorney General Xavier Becerra said, as he connected global warming to the deadly wildfires burning out of control throughout the state. "Can someone please inform the folks at the White House and our federal government of those facts?" 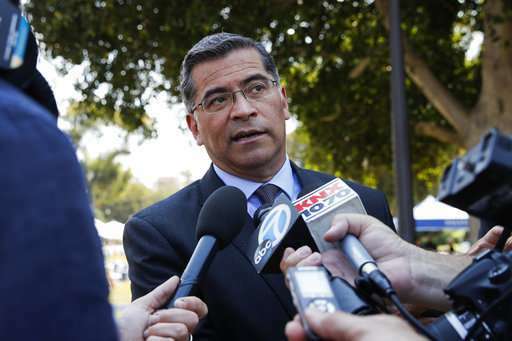 Becerra also promised another lawsuit if the administration makes good on what he called "arbitrary and capricious" plans to revoke a longstanding waiver allowing California and other states to set their own stricter auto emissions standards. At least twelve other states and the District of Columbia follow California's rules. Officials in the Trump administration said their actions would make autos more affordable and that would make roads safer because more motorists would be driving newer cars with the latest safety features. Becerra and attorneys general from 16 other states sued in May to stop the EPA from scrapping standards that would have required vehicles by 2025 to achieve 36 miles per gallon (58 kilometers per gallon) in real-world driving, about 10 miles (16 kilometers) over the existing standards. The Trump proposal would freeze standards at 2020 levels when vehicles will be required to hit an average of 30 miles per gallon (48 kilometers per gallon) in real-world driving. States that joined the lawsuit said the change would end up costing more money at the pump because vehicles won't go as far on a gallon of gas, and more misery for those suffering pollution-exacerbated maladies such as asthma. "This has to be absolutely one of the most harmful and dumbest actions that the EPA has taken," Massachusetts Attorney General Maura Healey said. "It's going to cost drivers here and across the country hundreds of millions of dollars more at the pump." Pollution from cars, trucks and other on-road vehicles is the California's single-largest source of greenhouse gas emissions, according to state data. California has set a goal of reducing greenhouse gas emissions 40 percent below 1990 levels by 2030. It met its 2020 goals four years early, but hitting the next target will be much harder without cleaner vehicles. The state has struggled to rein in vehicle pollution. Transportation is the only sector where greenhouse gas emissions went up in 2016, the most recent data available. The lawsuit filed in May in the U.S. Circuit Court of Appeals for the District of Columbia alleged the plan to dump the mileage standards violated the federal Clean Air Act and didn't follow the agency's own regulations. The lawsuit is proceeding, and Becerra said lawyers will now pore over the documents filed with the proposal to help make their case. Other states that joined in the lawsuit were: Connecticut, Delaware, Illinois, Iowa, Maine, Maryland, Minnesota, New Jersey, New York, Oregon, Rhode Island, Vermont, Washington, Massachusetts, Pennsylvania, Virginia and the District of Columbia. All have Democratic attorneys general. "It's going to cost drivers here and across the country hundreds of millions of dollars more at the pump." Now who could possibly be benefiting from that?